Taking care of the environment isn’t just an issue for governments and big business to solve — everyone can make a contribution at the individual level to reduce pollution and energy consumption. For homeowners, that means taking a good look at the amount of energy their homes consume and reconsidering how they use it. Although many homeowners are turning to alternative sources of energy such as solar panels and geothermal power, it is possible for homeowners to make a difference without making major changes to their homes. Not only can homeowners make a difference to the environment, but they can end up saving themselves a lot on their energy bills, as well. It’s no secret that American homes consume a lot of energy, but what many homeowners don’t realize is that a lot of that energy ends up being wasted. Whether it’s because of inadequate insulation, cracks in the walls or windows, or lights being left on when no one is in the room, energy waste costs American homeowners nearly $300 billion each year. That means practically every home in the country could make some improvements from an energy-efficiency standpoint. The best way for homeowners to find ways to improve the energy efficiency of their homes is to hire a professional to conduct an energy audit to identify areas of improvement. However, homeowners also can conduct their own DIY energy audits to identify many of the most common and easily fixed energy-efficiency issues around their homes. Using the following checklist as a guide, homeowners can inspect their homes and find some simple ways to reduce the amount of energy their homes waste. 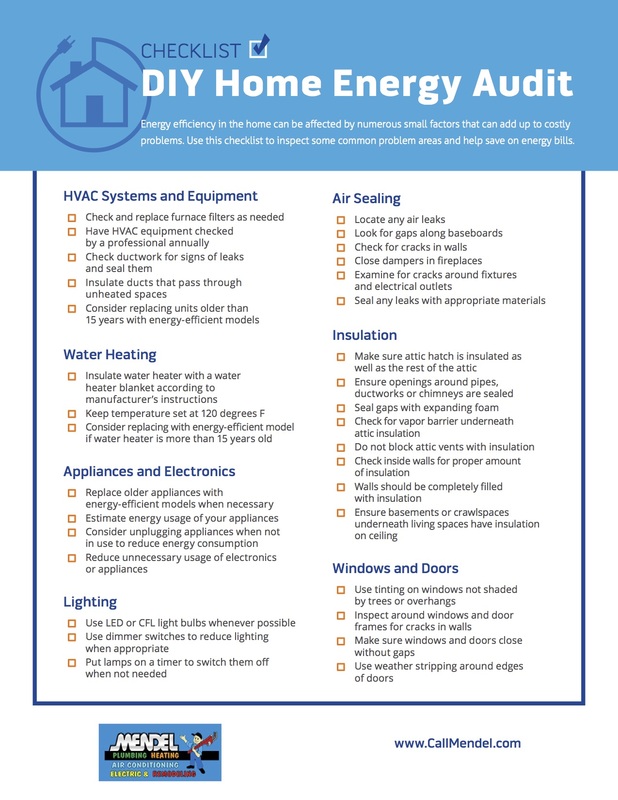 It doesn’t take a major change to your home to make a serious improvement in your environmental impact and your energy bills, so use this DIY home energy audit checklist as your starting point.